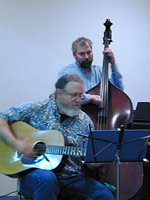 The Living Tradition offers monthly folk music jam sessions that allow musicians (and singers) to learn, practice, and enjoy traditional music in a relaxed atmosphere. 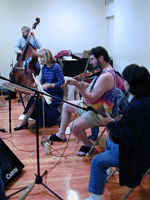 Jams start around 5 PM on the 4th Saturday before the contra dance at the Anaheim Downtown Community Center, 250 E. Center St., in Anaheim (in the heart of Orange County). Free parking. Occasionally, additional folk jams are held at other locations. Our participants play a wide array of instruments, from accordions to zithers, and a variety of traditional folk tunes, mostly from the Fiddlers’ Fake Book (by David Brody) and the Portland Collection (by Susan Songer). Come join us! Open to all ages and levels of experience. Vocalists and song circles are also welcome. We begin with a slow jam to encourage novices. Our fast jam sessions challenge old-timers. We request a $2 donation per person. Details about 2019 jams will be added as information becomes available. Here is a sample of the music played at the jams: JamMusic1. Visit The Living Tradition on Facebook. Also, we're on Meetup.com. Search for "folk" or "dance" in Anaheim, CA.